Have you ever wondered how it works? People usually ask this question whenever they see soldiers, secret agents or spies wearing night vision goggles and searching for something in the dark. Even if you are not wearing the goggles, you can easily determine the reason why people wear them. One obvious reason is for them to easily find the person hiding or things lost in the dark. Also, individuals use night vision to monitor something suspicious outside during the night. Hot objects give off infrared radiation, which is a kind of energy. This is what night vision devices are designed to detect. What you can’t see with the naked eye, you can detect with one of these special devices. If you search for these products online, you’ll find a lot of them and most of what you’ll discover are those which kids wear and play with. 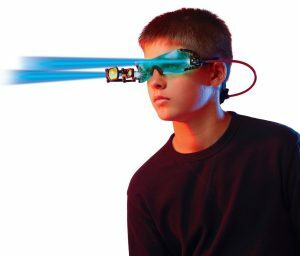 You’ll often see cheaper night vision goggles on list of the best spy gadgets for kids. You might want to consider picking up a pair for a Christmas or birthday present. The next question is, are these goggles for real and can one really see things and people clearly in the dark wearing them? Let’s get to the science part of it to find out how you’re able to see in the darkness. There are two different ways of how the night vision works. First, is through enhancement of image. This is possible through the collection of small amount of light which includes the infrared (IR) light’s lower person. Second, is by means of thermal imaging. This is a technology that captures the infrared light spectrum’s upper portion. The same spectrum is produced as heat by the things instead of simple reflection such as the light. Whether they are for adults or kids, the manner of how a night vision works is basically the same. If you are interested in getting a night vision, it is important for you to know that the price for these devices varies. It depends on how you’re going to use them. Are they for an outdoor fun activity? Will you be using them to secure your property outside? Or, do you need one that you can use as a security professional or expert? As technology has improved, people have classified it under different generation: 1, 2, 3, and 4. Here are the details about each of the generations of night vision and some of the details about each kind of night vision device. Lack of versatility. For example, you can’t really add it to a rifle scope, or use it to capture video or still images. Shorter life expectancy for these devices, as well as reduced battery life. For something like hunting, it may be good enough and you can certainly pick up something for under $100. Longer battery life, and life expectancy of the device. Very durable and with a long life expectancy. The last one, generation four is a bit up for debate. According to the US Army, this designation doesn’t really exist. Upon testing, these devices that were initially classified as this didn’t meet the US Army standards and so this designation was removed. These days, it’s more of a marketing ploy for companies who make products using this advanced-level tech. That said, it may be slightly better than gen 3 for some specific purposes. However, not everyone are converts, so it’s kind of wait and see with this one. What’s the Deal With White Phosphor Technology (WPT)? WPT is now available in all version of night vision devices. The main difference is that the images are black and white, as opposed to the standard green and black. The advantage to this technology is that the images are more natural and they can show better contrast in some cases. The military has mostly switched over, and we expect most consumer devices will soon follow suit. For fun outdoors, you can already achieve your purpose using specialized goggles. Most of these goggles are for kids but if what you need is just to be able to see an image, a person or an activity in the dark, these goggles can already efficiently function for you. If you are looking for something more serious for professional use, consider the Armasight Vega Goggles. These have special flip-up head cover to protect you while you’re outdoors and in the dark. People who usually opt for the Armasight Vega goggles are those who are into airsoft gaming, paintball competition, or security work. As mentioned earlier, whatever your choice is, you still get the same clear vision at night. Do you have any questions about how this works? Anything you’d like us to add to the article. Leave a comment below and let us know!